The shuttle service has been revamped. 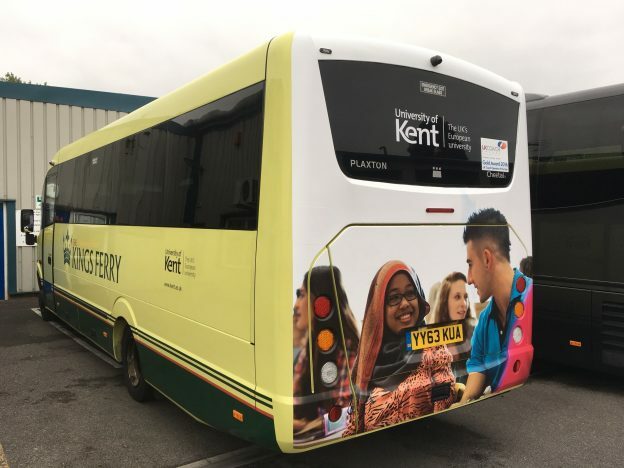 The Campus Shuttle can now be easily identified as a service provided by the University of Kent exclusive for University of Kent students and staff. For more images of the new look see @CampusShuttle on twitter. This year The Kings Ferry has developed a new ticket system. Although you do not have to, booking will guarantee you a seat on the service. This will also assist the University of Kent with monitoring the service. This entry was posted in News and tagged booking, campus shuttle on September 22, 2016 by Miriam Sandiford.